I met Wolfi Pohl from Garmisch-Partenkirchen at crampon point. 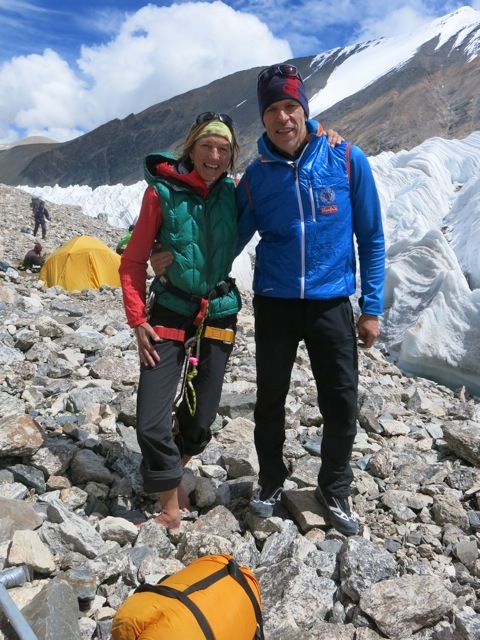 We just got back from C1 at 6,400m. Even though Sisha Pangma is considered one of the easiest 8,000m peaks the distances are very long. 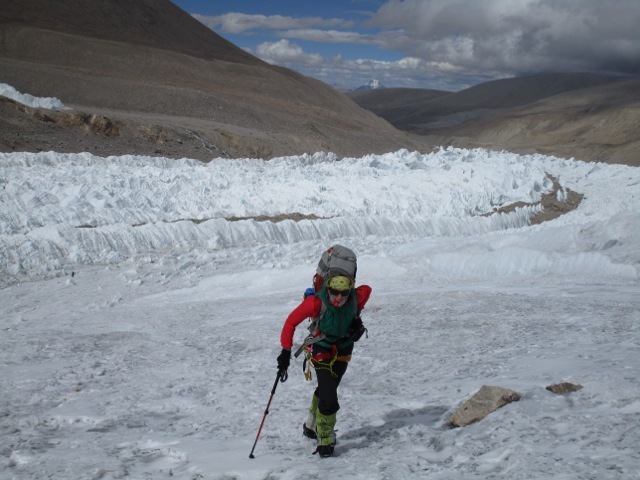 Compared to Makalu, where a trip to crampon point (the place where you usually put on your big boots and your crampons) took about 45 minutes, it takes about 2 1/2 hours to get to crampon point here – and you already feel tired. However, C1 sits at a nice spot and even though we were caught in a bit of a storm on the way up, we were lucky that your Sherpas had already pitched the tents, where we could warm up and rehydrate. After having had a good lie-in on Tuesday, we descended again to ABC to recover for a couple of days before we head back up to C1, followed by two nights at C2. This will be our second and last rotation on the mountain and we should then be ready for the summit once the weather allows. Being at ABC is also very nice for me as there are two climbers from my hometown Garmisch-Partenkirchen here, which gives me the chance to speak Bavarian and talk about home! Sorry for the short update, however, internet is very far and few between up here and I am just sending this quickly to the (in)famous robot back in Kathmandu, who very kindly puts this up on my website. For more news in German, you can always check outÂ www.kobler-partner.ch. Bravissima Billi, “daje” come dicono a Roma.